In 1865, after major improvements to Geissler's pump, Hermann Sprengel invented the mercury vacuum pump. This tool made it possible to produce vacuums with less than one hundredth of an atmosphere in cathode ray and X-ray experiments1. 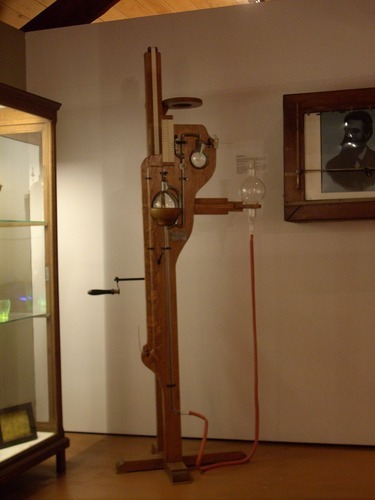 A specimen of this apparatus is displayed in Museum Dr. Guislain in Ghent. "Later adaptations will be added by Auguste Raps, and it is more particularly this last type of pump that Röntgen will use"2. 1. Retrieved and adapted from the Museum's explanatory tag. 2. R.Van Tiggelen, A Transparent Skull. An Illustrated History of Neuroradiology, Memogrames, Bruxelles 2007, p. 6.